love it; reminds me of a time (right after we moved to NM) I was geting my hair cut in the Dallas area where we had lived before. The young lady who cut my hair asked me where I lived, I told her NM, she said she envied me cause of all the awesome beaches..I don't think I ever saw a beach along the Rio Grande. Of course I explained to her that NM wasn't anywhere near Cancun and Cozumel nor was it part of Mexico. She preceeded to ask me when that happened? Now that sure doesn't fit the dumb Texan sterotype does it. 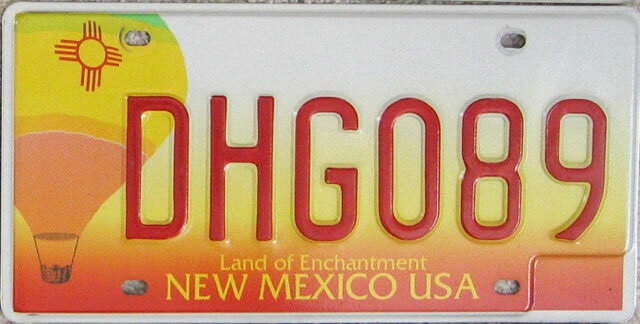 I've always noticed New Mexico tags always have "New Mexico USA" written out. I think a lot of clueless police officers around the US would assume New Mexico has nothing to do with the United States. Wow, this is such an old thread, and it's thrived to 30 pages! That's impressive! As a rule I don't post to threads longer than 6 pages (the contents tend to fizzle out by then) but kudos to the OP for generating so much interest. I think the whole south is pretty much stereoptyped and that's really too bad. Because, although I've never been to Arkansas, I'm sure it's as good a place as anywhere else. Yes, there are cultural differences from one region of the US to the other, along with climate differences as well as political and historical differences. How BORING it would be if all states and its people were exactly the same! And we have choices. I live in the Pacific Northwest, and certainly don't hold the attitude that it's "better" than Arkansas. In fact, I envision Arkansas, and the south over-all, as having their own reedeming qualities that can't be found elsewhere else. I don't have "red-neck phobia" so prevalent in these forums, nor do I think the populace mostly sits around their front porches with goose guns and bearing toothless grins. I love New Mexico by the way. Deming, Albuquerque, Gallup, and Santa Fe are absolutely wonderful. right? I'm seein' a whole new side of txdave! One example by a very young and obviously not terribly educated young lady. This isn't typical of much of the Dallas area. Certainly not in the particualr area this happened in. The area is upper middle class, mostly Blue ribbon schools and certainly filled with kids that go on to top universities. Yes, those kids do exist in Texas whether you think so or not. Negative stereotypes are generally bad but they do serve a good purpose. What if Arkansas was truly believed to be the land of milk and honey by everyone around the USA(And Mexico, Africa, Europe..etc). There would be way more people moving there overpopulating the place. At least the negative stereotypes keep the hoards of people out. I live in Nebraska and the negative stereotypes we have keep the place from being taken over by foreigners. Not that it's bad that people move to other states, but you want your own state to have it's own identity. I like Arkansas the way it is, and I am planning on moving there in 2 weeks. I'm in Missouri. We think you guys are completely country-dwellers..
Maybe its because there arent very many heavily populated/well known places down there? I wish stereotypes didn't exist, and we could all just let everything go, turn the other cheek etc.. This is also a valid point. A broad, (albeit inaccurate) stereotype does help ensure that people relocating to an area actually do their research about where they are going to live and that they'll be happy there. Arkansas/Nebraska/etc. would probably like to avoid the problems that have happened with states like California, or places like NYC, which often grew due to a very positive mental image that may have overridden more logical concerns like cost of living or employment opportunities in the minds of the people moving there, who now like to whine about the cost of living and employment opportunities. I absolutely agree that it's important to really know where you're going to be living.